Home » Articles » HR Pipeline: Learning From Experience: Is It Overlooked In Your Organization? The No. 1 driver of leader development is learning from experience — and it gets the least attention. CCL research shows that the vast majority of valuable leader development experiences happen on the job as leaders deal with challenges and adversity. But most organizations focus mainly on the coaching, mentoring and formal training programs that deliver an important but smaller portion of a leader’s development. 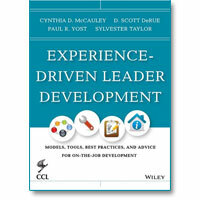 A new book, Experience-Driven Leader Development: Models, Tools, Best Practices, and Advice for On-the-Job Development, provides practical answers from individuals who are championing experience-centric leader development systems in organizations. The book is co-edited by Cynthia D. McCauley, a senior fellow at CCL; D. Scott DeRue, management professor at the University of Michigan’s Stephen M. Ross School of Business; Paul R. Yost, associate professor of industrial-organizational psychology at Seattle Pacific University; and Sylvester Taylor, a director in CCL’s research, innovation and product development group. Experience-Driven Leader Development offers proven tools and practices to develop talent at all levels of organizations. It includes case studies and examples from organizations including Accenture, Experian, GE, IBM, McKinsey & Co., Roche, Royal Bank of Canada, Teach for America, U.S. Army and Wesfarmers. Developmental Experiences: More Intentional for More People. How can you help more people gain leadership experiences that target their particular development needs? Leaders: Better Equipped to Learn from Experience. How can you enhance leaders’ ability to learn from their experiences so that they extract the maximum developmental value? Human Resource Systems: Designed for Experience-Driven Development. How can you build experience-driven development into these processes, embedding it in the organization’s DNA? The Organization: Enabler of Experience-Driven Development: How can you influence the organization more broadly to enable rather than inhibit experience-driven learning?